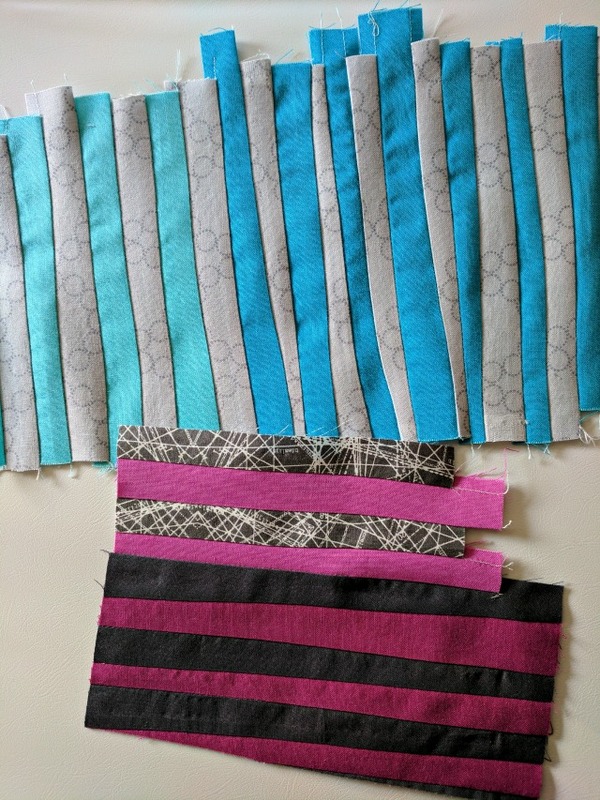 Just popping in with a bit of an update on the Improv Stripes QAL going on now on Instagram! Over 50 of us are sewing along together and what a gorgeous array of blocks are showing up in the #improvstripesqal hashtag! Not mandatory of course, but if you are sewing along, consider making some 'mixed' blocks if you haven't already. Or in some way, make a few that are different than the others you've already made. Whatever, have fun and don't over think it! To you who are joining in, do keep me updated either in the comments here with links to your progress photos, or feel free to email me at aquilterstable@gmail.com. Come Friday we'll start considering layout for our final pieces! This will be my first "modern" quilt. From the modern quilts I see solid colors seem almost regulation. This may sound silly but I will be using tone on tone. Is that OK? I see you have some blk/wht fabric but to me that is a more modern feel. Let me know. No one likes their quilt laughed at. I am following along and have several blocks made, but haven't had a chance to blog or post IG photos yet! One question: should we square up the blocks or cut off those uneven ends yet? No - don't worry about trimming those ends until you get to layout... How you trim may be affected by your decisions then. I just found out about this from Quiltswissy. What a fun and exciting quilt-a-long! I have been making improv striped quilts for many years although the technique I use is different from yours. I will be checking in to see the progress your followers make. Just for fun I will email you some pictures of my striped quilts. I have no idea how to use instagram - yes, that is pathetic I know! I am following using scraps. Love doing this. Now I just have to figure out how to use instagram! I'm following and have a some blocks made up. Instagram doesn't like me so I'll post my photos on my blog, crazyvictoriana.blogspot.com. I work slow but sure not fast and whizzy, I hope that works. I think there are many possibilities with these blocks and the variations a person could follow are endless, fun time! PS I was in your improv class at Gossypium. This is my first quilt along in a long time! What a fun project! I just had to join in. I posted photos today on my blog with a link to your blog. Don't know how to use Instagram! Where can I see the steps? ?